One of the many deep-seated convictions shared by various presenters at the Acres conference was the strong correlation between nutrient-dense food and forages that are grown and raised on bio-active, minerally-balanced soils, and the good health of the creatures eating them. It was a primary, underlying message in nearly every lecture, workshop, and discussion I attended. From veterinarians to agronomists, cattle breeders to seed specialists, this broad gathering of agrarians may have had differing points of view on more than a few issues, but they spoke with one voice when it came to the importance of quality of what they were growing: it matters more than anything. This surprised me a little, and then it saved me. I fully expected the onslaught of information on building healthy soils, selecting livestock that makes good gains on grass, and developing smorgasbord pastures. In the Grazing Management course we learned about the feed value of weeds (surprisingly higher than prize-winning grasses and clovers), the value of hedgerows, and the critical role minerals and trace elements play in plant and animal development. We learned how to identify beef animals that will consistently produce tender, marbled meat on a diet of grass, and we heard from master graziers who have perfected the art of rotating herds through paddocks to grow huge volumes of grass where only scrub existed before. Much of what I listened to those two days I’d already encountered in my studies, which was quite affirming. Hearing it from the sources, with their personal stories and amazingly deep understanding of their subject, was invigorating. Still, I was surprised. I did not expect to be surrounded by a group of people so intensely dedicated to improving the nutrient value of what they and their customers eat. This organic farming stuff, it’s not just about eliminating chemical fertilizers and poisons. Nor is it just about building and conserving topsoil, or sequestering carbon with permanent pasture plants, or raising food animals humanely outside of cages and factories, although those are vital aspects of this great endeavor. But it’s really about the food, and how the food we grow can be much better than what is generally available. So much better, in fact, that it functions as medicine. Because food packed with minerals, enzymes, CLA’s, omega-3 fatty acids, and protective nutrients, is incredibly fortifying, and healing. Food as medicine. As it should be. Which was a message I really needed to hear. A reminder, really. Nothing I didn’t already know, just truth I’d drifted away from. Then during the conference, the holistic veterinarian began his excellent briefing on homeopathy by discussing how proper hygiene – the modification and minimization of noxious external influences on the patient – is necessary to health. It is a precursor to health. You can’t activate the body’s innate protective abilities unless the system is clean. 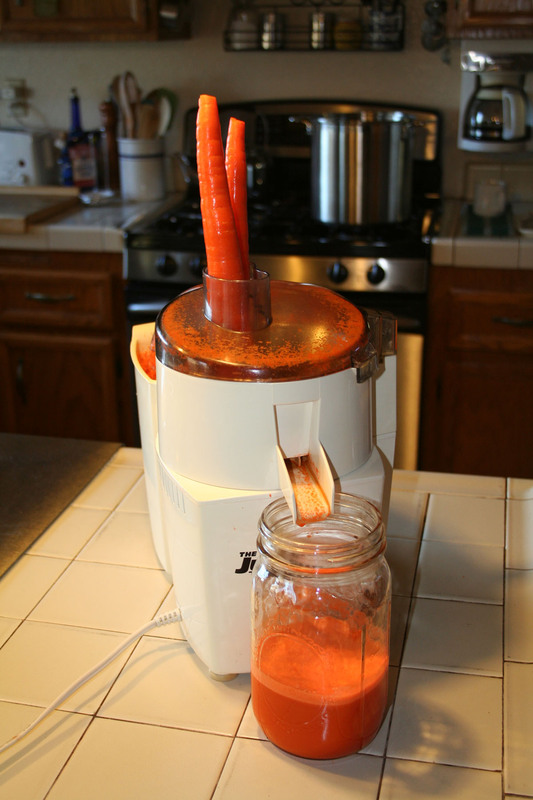 I met a remarkable octagenarian who grows micro-greens in his basement, and drinks a pint of fresh carrot juice each day. Said his eyesight improved considerably since he began this regimen. His good health is undeniable. He is three years younger than my mother would have been, had she not lost her battle with leukemia. I thought about my degrading night vision, and my lungs and liver challenged by bad habits these past few years. I thought about all the farming work I have ahead of me, and how much I needed my health and vigor back. And just like that, the light came on. And my mind-view changed. My juicer sits out on my counter now, rescued from the back of a bottom cupboard. A pound of organic carrots runs through it every night, part of my rescue. And with every pint of enzymes and pro-vitamin A I drink, my resolve to avoid toxins and improve hygiene grows. No prescription required. Imagine that.